Ocean Bay Club 310 has been recently refurbished and is an idyllic beachfront getaway for you, your family, and friends. 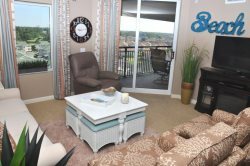 This 4 bedroom corner unit sleeps 10 and provides ocean views from every window. The front balcony looks directly out on the ocean with views up and down the coast, while the side balcony provides a view of the ocean as well as inland. As a added bonus, lucky guests who stay in this unit- Memorial Day through Labor Day - will also have access to a beach umbrella & 2 chairs delivered to the beach daily for your stay! For your entertainment, the living room features a large flatscreen Smart TV with cable and a full sound system. Each bedroom is also equipped with flatscreen Smart TVs, with cable in the master bedroom. The Smart TVs connect to the free WiFi and feature a myriad of media apps. If your idea of going in the water doesn't involve the ocean, fear not; the private master bath houses a sizeable whirlpool tub. And if you appreciate aquatic fauna but don't want to dive to the bottom of the ocean to see it, you're in luck; just sit back on one of the comfy living room couches and enjoy the coral and starfish displays. Or if you're more the active type, the third floor also features a well-equipped ocean-view workout room. Ocean Bay Club amenities include a large outdoor pool, hot tub, lazy river, kiddie pool, and indoor pool. The building is a short walk from Main Street where you will find most of the shops, restaurants, live music, and bars in downtown North Myrtle Beach. Don't like walking? No problem, you can park your car on the 3rd floor parking structure right outside the unit and avoid having to worry about using the stairs or waiting on an elevator. Are you still reading this and haven't booked unit 310 already?